At Israeli Checkpoint, Tear Gas And Ice Cream A Way Of Life : The Two-Way At the Qalandia checkpoint between Jerusalem and Ramallah, violent flare-ups can be as routine as vendors selling ice cream and CDs. 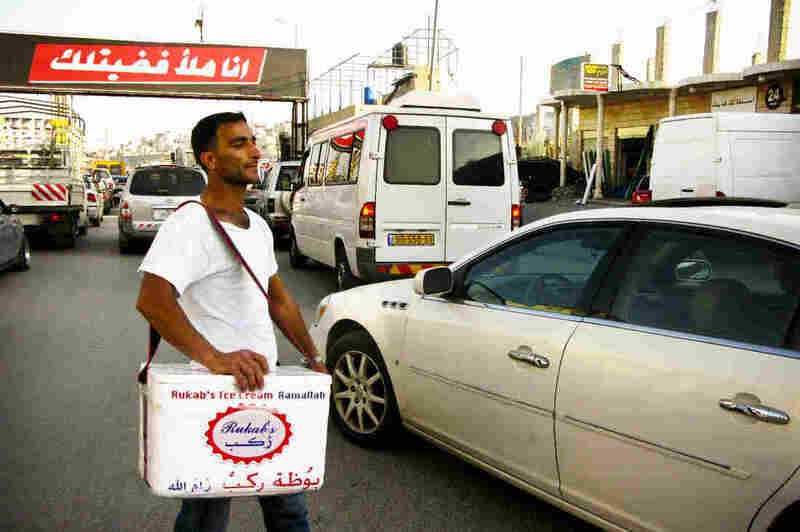 Ahmed Fahad sells ice cream from a Styrofoam cooler through tangled traffic at the Qalandia checkpoint between Jerusalem and the West Bank city of Ramallah. Ahmed Fahad is a savior on a hot day. Yelling "Ice cream, ice cream!" 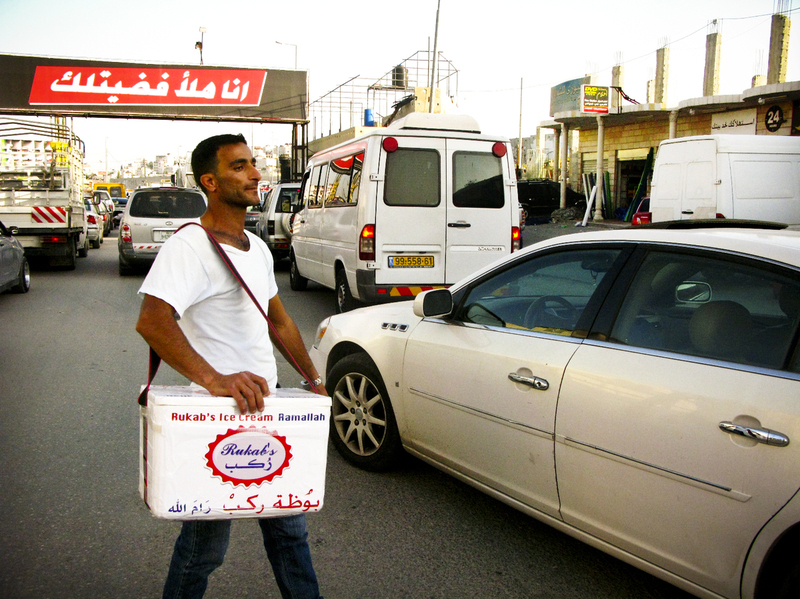 in Arabic, the Palestinian man carries a Styrofoam cooler through tangled traffic at the Qalandia checkpoint between Jerusalem and the West Bank city of Ramallah. I roll down my window to signal to him but taste the sting of dissipating tear gas instead. Israel built a permanent checkpoint at Qalandia after the second intifada began. It is one of many Israeli checkpoints throughout the West Bank. 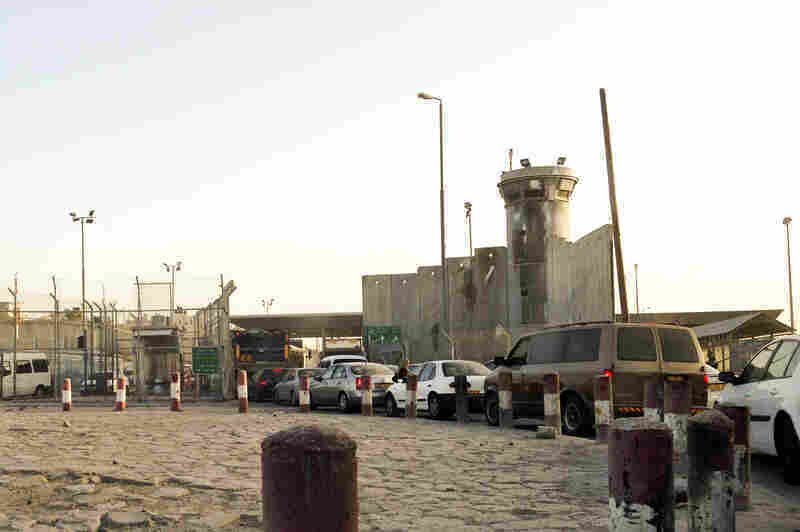 Israel built a permanent checkpoint at Qalandia after the second Palestinian uprising, or intifada, began in 2000. It's one of many checkpoints throughout the West Bank and, in the eyes of many Israelis, a successful security measure that has stopped Palestinians from traveling into Israeli cities to set off bombs. Palestinians see the long, winding barrier as part of a territorial grab by Israelis in the West Bank. Israel forbids its citizens from crossing into Palestinian parts of the West Bank, although no one checks them. The Israeli focus is on Palestinians seeking to enter Israel, a mutually unsatisfying exchange both for Palestinians who have permits to make the crossing and for Israeli soldiers, though in very different ways. Like many checkpoints, Qalandia is also the site of frequent confrontations between young Palestinians and Israeli soldiers. Typically, Palestinians throw rocks and Israeli soldiers shoot tear gas, although firebombs and live ammunition are used at checkpoint clashes, too. Ahmed can choose his hours hawking ice cream; flexibility is one of the perks he enjoys about the job. And like other street vendors here (CDs, toys, fruit and car sunshades are popular items), he often works through the tear gas and rock throwing, even though he doesn't like it. Ahmed says these flare-ups are "useless" in improving Palestinians' lives. What strikes me, stuck in traffic in the middle, is how routine they appear. He keeps selling ice cream. Palestinians keep walking and driving, trying to get to where they are going. Waiting in traffic on one side of a wall between the checkpoint and the main road to Ramallah, I pass close enough to touch Israeli soldiers shooting tear gas canisters. Another day, during another confrontation, I pass on the other side of that wall, just as close to a group of young men pounding a big chunk of concrete on the sidewalk, breaking it into pieces small enough to hurl. Tear gas and ice cream hadn't been paired in my mind before. Here, they are.